Yusuf Goolamabbas shares with me from the Oublaze offices in Cyberport (see pics), in this short clip we cover a lot of ground. In the time I spent with him, I learned that he sees the web from a very strategic point of view, and shares his views on the state of the web industry in Hong Kong. 1) What’s his view on the web industry in HK? 2) How can 150% cell phone penetration be accurate? 4) Social Networks in Hong Kong, why is Facebook hot, but yet a fad? Yusaf, wishing you and the rest of the folks over there good wishes, hope all is going well. Arrived in Hong Kong, although my fifth time here, the sheer size and energy of the city that’s always under construction always amazes me. The flight over, on Singapore’s luxurious planes was fantastic, I feel rested when fully reclining in a chair after 14 hours of flight (flickr photos). On the way over, I was able to read a ton of Forrester material, analyze a few strategies, and just relax. Tonight is the Hong Kong Blogger dinner that I encouraged everyone to come to, there’s over 60 folks, and OutBlaze, a white label communications company has offered to be a gracious host. 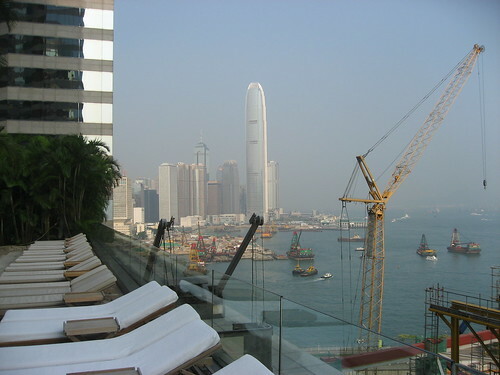 I’ll be hanging with them and other technologists over the next few days to understand Hong Kong’s web scene better. When I meet people from the Finance industry, I often tell them I’m in “new Media” first, if they probe farther I’ll explain it as social media or social computing, so far, most understand. I’m also reading, listening, and absorbing data points about Asia’s web scene. Today, one of the executives of China Mobile presented, she gave quite a few facts, trends and data points. Wireless infrastructure for one of the world’s largest cell phone market (China), will access the web via the phones. Advertising Spend: Online Growth is 68%, while the second highest, radio is a mere 20% growth. It’s truly an international conferences, at the back of some rooms, there’s small glass enclosed boxes where translators sit and transmit to wireless devices so everyone in the audience can absorb the knowledge. Hey Web Strategist! Are you paying attention to what’s happening in Asia? There’s going to be a lot of eyeballs here, what are you doing about it? Here’s some stats from the World Internet Usage. My schedule the rest of the week? It’s Tuesday right now, but on Wednesday, I’ll be visiting some of the offices of folks that hosted the dinner, and will meet a few other entrepreneurs. I speak on Thursday, and am free on Friday if you wanted to meet for tea or coffee here at the Grand Hyatt to discuss Asia’s web industry, I’m very curious in learning more. A few weeks ago, I pinged my network (using Twitter) to find out what you wanted ask the management team at Twitter. Jennifer Jones took that feedback (our shows are about community) to ask take questions from Ross Olson, and David Dalka and others. She was able to sit down with co-founder Biz Stone, to get answers, thanks Jennifer. Be sure to see the list of questions that were raised in these comments, the cat questions are the funniest. (If you’re not a Twitter user, you’ll need to watch this video to find out what that means). Twitter’s icon is a bird , so when something goes wrong with the site, the Twitter’s 404 page is a cat icon, a lol cat to be specific. And Jennifer asks the hard question: “Why are there so many error pages, and when are they going to be fixed?”. This is very relevant considering now that some are defecting to Jaiku. By the way, if you want to add me as a Twitter contact, my profile is jowyang. As you may know, I’ve cut out Instant Messaging completely out of my life, I found it too disruptive and distracting. I think I may have found a better tool, that’s less invasive and puts the user in control. 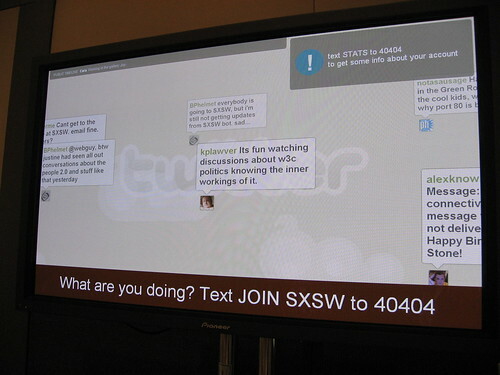 A lot of folks are using twitter here at SXSW, if you’re not familiar with it, it’s an online and mobile chat room, where you can add (or remove) the contacts you prefer. It’s a social network, where individuals can share their status, location, or communicate directly with others. Since this is an opt in and opt out model, there should be more difficulty for marketers to spam the site, or users will remove them. Eddie Codel and I cruised to some of the tech gatherings last night, and we were using Twitter to check the status of our shared contacts to find out where things were happening. Other folks are using this tool as well as text messaging to find out where people are. Eddie commented that last year, Dodgeball was all the rage, and now it’s seemed to have moved to Twitter. You can add me as a Twitter contact, my profile is live on the web as well as the chatter of my preferred network. Attention Google Talk, Yahoo Messenger, AIM, and others. It will be interesting how this early adopters of this tool will spread to mainstream, and then to the enterprise space. Update: It’s amazing how many folks came up to me today and said they read my twitter messages about how bad the bed is at the hotel, amazing. (Shelbinator has an interesting analysis, looking at Twitter from a different point of view, worth a read. I got the opportunity to interview Shannon Clark at Doc Searl’s Mobile ID workshop. He shares with us a few of this projects that he’s working on, Never Eat Lunch Alone (NELA). Of course the topics of how to gain that identity and information is important. I hope Shannon swings by and leaves us an update with how things are going with his projects.